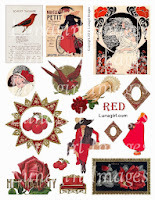 Lunagirl Moonbeams by Lunagirl Vintage Images: Seeing Red at Lunagirl.com! 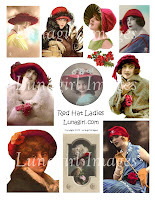 I'm not sure what came over me, but I became obsessed with red and created these three digital collage sheets on a RED theme: Lots of women and girls in red, red hat ladies, red birds, cherries, frames, roses, so much variety, and a whole sheet of 1x2 images. And who doesn't love red? 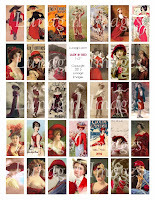 Click on each pic to go to a large size image at LUNAGIRL.COM.